Enrique Peña Nieto (aka as the Savior of Mexico) will meet today in Toluca with President Barack Obama and Canadian Prime Minister Stephen Harper. 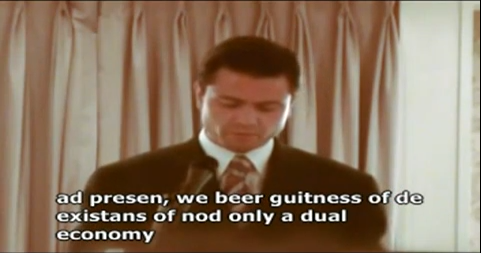 But despite all the good vibes and buena onda around this meeting, I’m genuinely worried about Mr. Peña Nieto’s poor command of the English language. So, even though I didn’t vote for the chap, nor I think he is saving Mexico, I’d like to take this opportunity to offer him my services as a professional simultaneous translator; or if he so prefers, to facilitate proper subtituleishon for his speech -which I’m sure will be historic. This entry was posted in Language, Latin America, Mexico, Why I Love Mexico and tagged Barack Obama, enrique peña nieto, Mexico. Bookmark the permalink. Here we go again… I wonder if Jimmy Neutron -Peña Nieto- will too make use of intelligently spoken, eloquent and politically correct phrases (Fox und Marthita style, raza) such as: “Los hispano parlantes (or “Latinos”) hacen los trabajos que ni los negros quieren” and so on. Oh, I can’t wait for him to speak before Obama, King of the Gringos! ’twas written in the Mayan prophecies! Lovely and poignant, as per usual.